2012 | Live a life worth writing about. Hello! So I have not done a favourites post in quite a while, so I thought I shall catch you up with some of the things that I have been liking this month. This includes, things to do, music, videos, beauty products, fashion items, and other random things. All of the links to things I talk about (or pictures) will be included, so if you’d like to check something out, either click it, or I’ll have a picture included! Let’s start with music! The past little while I have of course bought tons of…Taylor Swift! But, to be a little more exciting, I do have some other bands that I will share. Oh wow. I just looked, and it seems I haven’t done a favourites post since September…wow! Well, I guess I’ll just mention like EVERYTHING then. So of course I bought T. Swift’s Red Album in October, so I’ll start with them! One of my all time favourite songs ever is All Too Well. I seriously LOVE that song. I also really love I Knew You Were Trouble (it grew on me) and The Moment I Knew. Another song that I have found and ADORE (number one next to Drops of Jupiter!!) is Dear John. Her voice in it is amazing. I wish I could sing like her in this. So good! Onto more exciting songs…that aren’t the same person, haha. A song that you will not believe I found from Jersey Shore….LOL….is Where We Started by Dinner And A Suit. It is a slow song, not crazy song like you would expect from Jersey Shore. Seriously, go listen to this song! A song I just purchased a few days ago is a cover song, and it is fifty billion times BETTER than the original. It’s Next To You by Chris Brown, but it is covered by Luke Conard, Alex Goot, and Tiffany Alvord. And the last song, The Only Exception by Paramore! It’s one of those songs that you always hear, but never think of actually buying it and playing it over and over. OK, that’s enough for music. Now, onto my new favourite TV show! I hate to say this, but I like it so much more that PLL. Yes. Drum roll please. GOSSIP GIRL! I have been watching it online, and it is my favourite show I’ve ever watched, and I am dying at the fact that it stopped. I have gotten to season 4 in about two weeks (AKA I have no life), and it is so much more real than PLL! I don’t know…I still watch Pretty Little Liars, but it hurts my head thinking about that show, man. It is so unrealistic, and I feel like the writers are trying to make you think one thing, but everyone is too smart, and then they put another crazy twist that nobody was expecting…Gossip Girl is just so much more real, and more me. I like the whole ‘rich kids in New York’ thing. I just like the characters way more and it is more relatable I guess. I am going to be so sad when I finish watching it! But maybe onto 90210 next? I haven’t watched TV for such a long time! I was in to Once Upon A Time and Grimm, but it was too hard for me to stay interested. Next up on the list….Youtubers! So the past couple months I have started watching British YouTubers, and I love them! Is is weird how you sort of ‘bond’ with certain people? Haha, well I was like that (and still am) with Ingrid & Luke, but since they don’t do daily vlogs too much anymore, I have found some new people that I really enjoy watching! There’s a few that sort of all hang out together, and they are….Jack & Finn, Zoella (FAV! ), Alfie, Marcus, Caspar..all of them! Another recent random favourite of mine is decorating my room! You may know that I completely re-did my room in August, and now I have decided to change it up just a little. I am keeping all of the furniture in the same spots, and the walls the same colour, but just decorating things a little differently. I am working on my bookshelf currently, and it is (cross your fingers) going to be completely different from what it looked like here. I will do a post on it when I have it all done. I also have a DIY going with it, so stay tuned for that. Of course I’ve been loving all of my presents from Christmas, including my UGGs, Burberry Scarf, and purses. I have gotten a ton of use out of absolutely everything, and so glad I got them. My boots are so comfy, and so light. 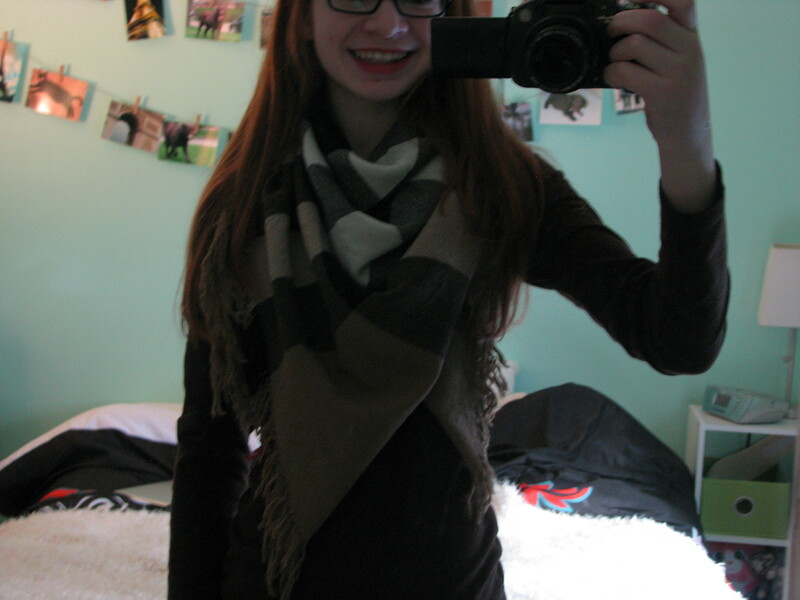 My scarf is of course a staple, and I wish I could wear it everyday. My Rebecca Minkoff bag is so convenient and pretty! I have gotten quite a few nail polishes this month, and I have been loving them on my nails so much! 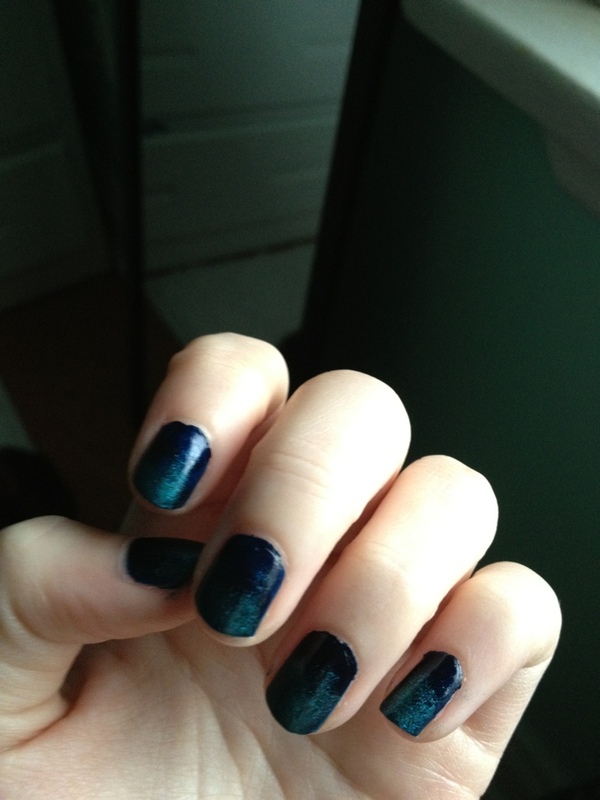 But, my favourite out of everything I’ve been wearing is gradient nails. I have done it twice in January, and it is so different from the regular mani. You can read my post on how to do it here. So, those are my few stand-out favourites of the month! Thank you for reading, I can’t wait to get exam weeks over so that I can start posting more! Talk soon. Pictures from here, here, here. Thank you! Happy New Year everyone! Here are some pictures that I (or my Mom) have taken over the holidays! I also included some things that I got because I always love when people show what they got for xmas in videos and in posts. I had a nice little break, and I hope you did too! Coat from Old Navy (MINT!!!) and Rebecca Minkoff Mini MAC in MINTTTT!! Olivia is very content. UGG Sparkle boots…yep…haha I love them! Danier bag…look familiar!? Mulberry Alexa….? That’s it! Thanks for reading! I had a lot of fun this Christmas. Happy New Year! I hope you’re enjoying it so far! Liv’s Life: Goodbye 2012 TAG! Hello everyone! So I just recently did a post on “what 2012 has taught me”, and I have decided to do a little Q&A session about the new year. If you’ve read that post, you’d know that this year has been pretty hard for me, and I want to make 2013 much better. I have chosen a series of random questions about 2012 to answer. Here we go! 1. What did you do in 2012 that you’ve never done before? Well, I went to Quebec for about five days away from my parents! I have been away from my dad before, but never my mom. 2. What would you like to have in 2013 that you lacked in 2012? A fearless and confident attitude. 3. Name some highlights of the past year. Well, Paris, Germany, Quebec City, starting high school. 4. What are your goals of 2013? I am going to do a whole bucket list/resolutions post coming up soon! 5. Favourite fashion item of 2012? Well, I guess I can’t count anything that I’ve gotten for Christmas (darn! ), but I will have to say my feather scarf that I got in Germany. I have worn that thing so, so much! 6. Favourite beauty item of 2012? Nail polish! For spring & summer it is any mint/ tiffany blue colour, and for winter or fall it is any dark blue or purple. 8. What are two songs that will remind you of 2012 forever? We Are Young and Call Me Maybe. 9. What would of made this year better? If I had more opportunities to do things. 11. What did you do (/are doing) that you are proud of? Not letting anybody change my beliefs or how I am. In high school everyone is the same and are trying to be like everyone else, and I’m not buying it. 12. What did you do on your birthday? Well, I went to school. And to a pep rally. Yep. Wasn’t a very happy time. 15. What was one thing you were obsessed with this year? Pinterest! And now tumblr! 16. What is a life lesson you learned? Things are going to go wrong, and people are stupid, but you can’t do anything about it and you just have to accept it. 18. What is the most nostalgic song of 2012? Enchanted by Taylor Swift. 19. What medical things happened to you this year? My spasm in my neck…arthritis & headache stuff. 21. Favourite movie you saw? Uhhmmm….I really liked Friends With Benefits. I love Mila Kunis and Justin Timberlake! 22. Worst thing that happened to you? Drifting apart from old friends & losing my best friend. 23. If you could go back and change anything, what would it be? Well, I hard a hard time answering this..but I’d say maybe stop worrying in Paris…I’m not sure. Maybe just like enjoy my trip more…I of course enjoyed it, but I wish I could stop being stressed. I’m not too sure. So, that’s it! Thanks for reading. If you’d like to answer these questions, leave them in a comment below! I’ll have my resolutions up soon, along with a post about my collage in my room, and a “what I got for Christmas 2012” if you’re interested. Talk to you soon. Have a great night! 2012 is almost over, and this has been the worst, most craziest year of my life, I’m so sad to say. It has probably been the most eventful year of my life too. I had ups, and many downs. This year I went to Paris and Germany! I went to Quebec, and I finished a big chapter of my life-graduating grade 8. I had been at that school from K-8, and I started high school. This year I have also found my love for quotes. My love for beauty and fashion grew larger and I changed my room up. I became more crafty and blog-savvy, and got tested in many ways. I have many more sides of me now that I never knew existed. During the process of starting high school, I lost a lot of friends. And when I say a lot, I mean all but one. And even that one isn’t stable. Don’t get me started. High school made us never see each other. Instead of looking back on all of the amazing things I did in my life, I look back at them now, and I’m so upset because I miss them. Looking at pictures of my trips makes me so sad. I want to go back. When I lost all of my friends and I started to feel this way, I came across “people change, memories don’t”. Even though time and people change, nobody can take away how happy I was during those events and little moments. The one thing that has gotten me through the most this year has been a little lesson that my over thinking has brought to me. “What can I possibly do about it?”. When something bad happens to me, 99% of the time, it isn’t my fault. What can I do about it? NOTHING but recover. “Life goes on”, “what doesn’t kill you makes you stronger”.